UNU-WIDER had a busy September. We celebrated our 30th birthday with some 600 people at our three-day conference on ‘Mapping the Future of Development Economics’ here in Helsinki. It was a great occasion. Highlights include a keynote by Nobel Laureate Joe Stiglitz (chaired by President Tarja Halonen). President and Nobel Laureate Martti Ahtisaari—who did so much to help UNU-WIDER at the start in the mid-1980s—attended the conference, and the WIDER Annual Lecture 19 which was given by Nobel Laureate, Amartya Sen (who gave us the wonderful name ‘WIDER’ back at the start). And our timing was perfect—just before the announcement of the Sustainable Development Goals (SDGs) at the UN in New York. A truly great month. And now to this Angle. We kick off with Roger Williamson’s piece on the 30th. With so much intense debate over 3 days, it takes someone of Roger’s skill to provide an overview of the main themes. And Roger rises to this challenge with gusto. We also feature his report back from our recent conference with TIPS (Trade & Industrial Policy Strategies) of South Africa, and there also are some great videos for you to watch from this meeting. Next up is a piece by me discussing SDG8. I look briefly at each of the three areas mentioned in this goal—growth, work, jobs—and consider how recent research has challenged popular thinking on these topics. Finally, Channing Arndt writes about UNU-WIDER’s recent work on Malawi’s fertilizer subsidy, and its impact on the poor. With the SDGs in everyone’s minds this month, VIDEOAngle features reflections by both Amartya Sen and Joe Stiglitz on the process and the outcome of the SDGs. 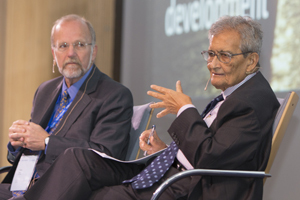 Amartya of course was one of the pioneers of the work around broadening out measures of development—his Quality of Life with Martha Nussbaum was one of UNU-WIDER’s very first books. And Joe has a new book out about inequality—one of the topics he discussed at our 30thanniversary conference. We are now well past the longest day (in June) when we had 19 hours of daylight, and heading into autumn and shorter hours. But the Institute’s light still burns bright as we move ahead. The 30thanniversary conference demonstrated yet again the superb skills of UNU-WIDER’s excellent support team: we couldn’t have brought together so many people from so many countries without them. One item that keeps us still busy after the conference is putting the final touches to the new UNU-WIDER website, which you will see very soon. In the meantime, Angle is back in November.